Director James Cameron dropshipped into the TagDF tech forum in Mexico City this past Wednesday and everything was definitely five by five. Probably the biggest single piece of news out of the event is that he is going to be focusing on BATTLE ANGEL after the two AVATAR sequels! This is huge news as many of his projects have been sliding from the back burner to the shelves over and over. He says that he will start to develop BA in 2017 once he is done with the Na'vi. And speaking of Na'vi, Cameron says that he will be honing in on story and characters more so than new technology this time around. This guy knows just what to say doesn't he? Definitely. 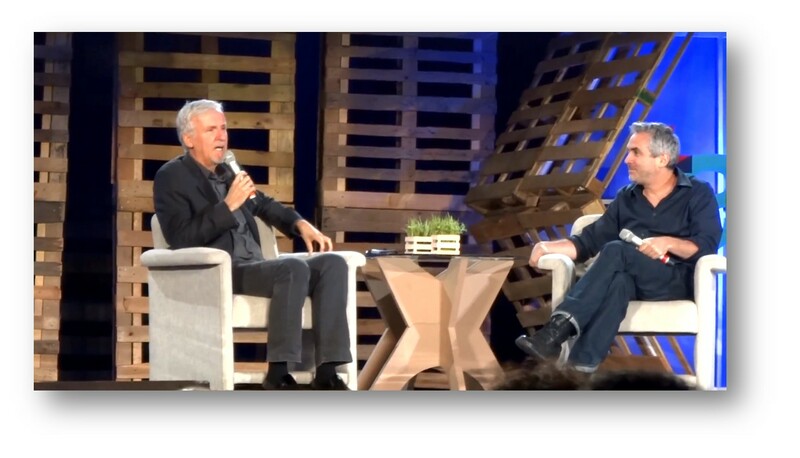 Additionally, he was speaking with GRAVITY director Alfonso Cuarón at the conference (see the video below) on stage. Apparently Cameron helped out Cuarón and his movie, giving him advice when needed. I am so looking forward to that movie. Cameron also expounded on 3D and what is happening in today's market. Again he emphasized the merits of native 3D vs. conversion (something I am steadfastly in agreement with) and that today's directors are having 3D forced upon them, even those who are not comfortable or don't like 3D. He accurately stated that 3D is moving away from directors and into the hands of the studios. Further he said that MAN OF STEEL and IRON MAN 3 "should not necessarily be in 3D. If you spend $150 million on visual effects, the film is already going to [look] spectacular [and] perfect."